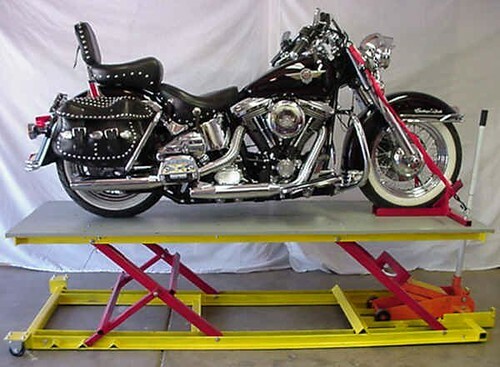 Thought I would post some pics of the bike lift I built. I poked around on the interweb but with a big pile of steel at home I figured I should just build one and bask in the glory of the home-made goodness. 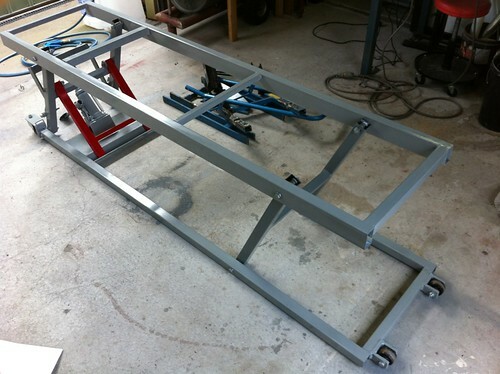 If you haven’t got access to cheap steel and a welding machine, it probably isn’t worth building one, since the imports bike lifts start at around $400 (at least here in Australia they do). 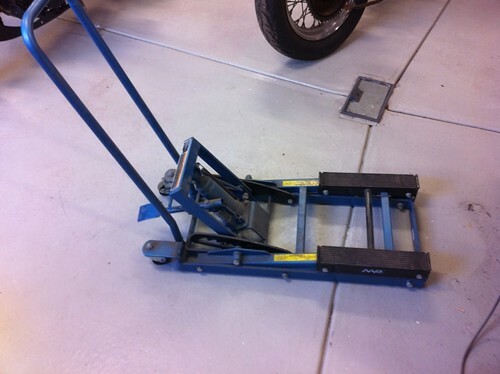 Then I remembered I had this old bike/ATV lift out the back. I bought it from Kmart about 10 years ago, paid $125, used it once, and didn’t think it was that useful. Mind you, at the time I had Jap rockets that had no frame rails under the engine. So I pushed it into the corner and forgot about it till now, when I decided I could chop it up and put it to better use. I started with the frame. The top is some 70 x 35 galv RHS I bought from my local steel joint. It was seconds, so it was cheap, like $14 per 4m length. I just sanded off the galv and migged it to the SHS cross members. The uprights were just chopped out of whatever SHS I had lying around. Hard to see in this pic but I went through all my tube offcuts and fusion tigged in some pieces to act as bushes at the pivot points. 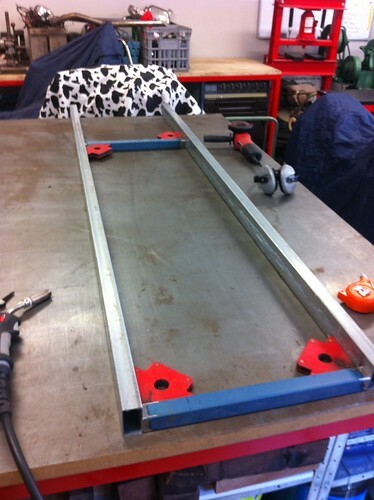 Here is the top frame and uprights clamped to the SHS bottom rails, just wanted to check the clearances etc before I committed to boring holes in the bottom rails. 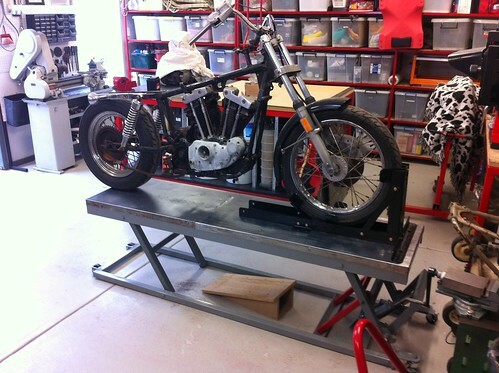 I chopped up the bike lift and grabbed the jack and a couple of frame parts that I thought I could reuse. I planned to use those black plates which are the locking/safety supports but it was a bit of work to engineer them in so I ended up doing something simpler. Here it is close to finished, assembled and painted. 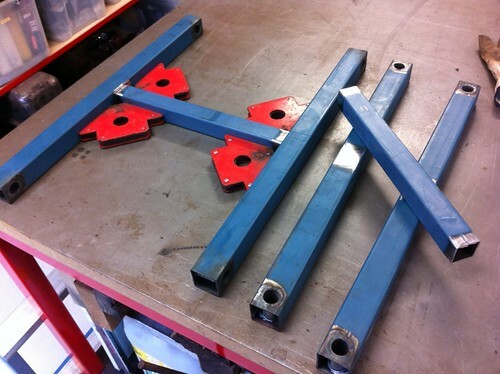 I cut the castors off the old bike lift and welded them on as well. Here it is completed with my Sporty basket on board. I used two layers of chipboard (16 or 19mm, can’t remember) on top of the frame, whatever I had lying around after house renos. Then I folded up some 0.5mm sheet that I had lying around and screwed it on. I suppose I could have left the chipboard but the steel is easy to clean after it gets covered in oil and looks good too. 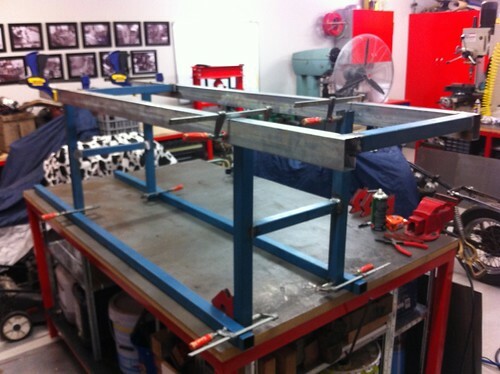 The red frame at the front end is the support/safety frame. The jack just cranks the lift up, then the red frame drops into a angle iron channel, then I lower the jack, so the red frame takes all the load, not the jack. MDF ramp underneath to get bikes on and off. Seems to hold up pretty good, even with a big twin chop on board. 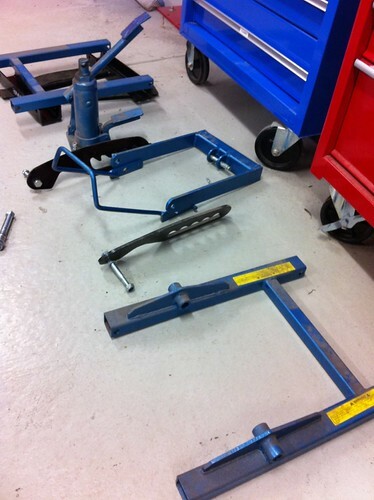 The frame flexes a bit, and the bottom rails bend under the load and bottom out on the floor, so you can’t roll it around on the castors when it is loaded. But hey, it cost me twenty bucks in spray paint cans, and about 20 hours labour to build. And its great to get a bike on it and work at a more comfortable level. I didn’t get any pics of the lifting mechanism, but unless you’re building one, you probably don’t care, but let me know if you want more details.